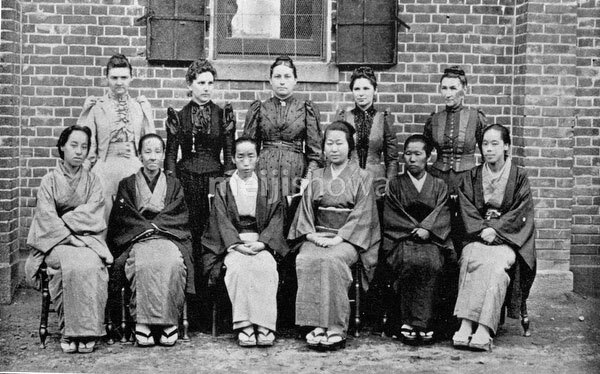 German-American missionary wives and Japanese Christians, known as “Bible women” pose in front of Krecker Memorial Church in Tsukiji, Tokyo, on June 15, 1893. Bible women visited homes and read there from the Bible. Front (left to right): Furuse, Fuji, Dasui, Ji, Uchiyama, Nozawa. Back: Neitz, Filcher, Vögelein, Dienst, Seder. The Krecker Memorial Church was consecrated on June 6, 1886 (Meiji 19) and was the largest church in Tokyo at the time.